Menthu was the Egyptian sun god of warfare and protector of the gods. Menthu was a very ancient god associated with raging bulls, strength and war. His likeness to a raging bull resulted in the worship of the Buchis Bull, called the (the Bakha) at Hermonthis. Egyptian Name: Menthu. Alternative names: Montu, Mont, Month, Monthu. The meaning of his name was "nomad". Titles: "Menthu, Lord of Thebes"
Translation of Hieroglyphics for Menthu: The owl hieroglyph represents the letter 'M'. The water ripple is the letter N. The knot hieroglyph for the letters 'th' and the quail chick hieroglyph is for the alphabetic vowel letter 'u'. Menthu, the Egyptian god of warfare, featured in the stories, myths and legends in Egyptian Mythology especially relating to the Buchis Bull. The consort of Menthu was the cow goddess Raet (Raettawy), and their child was Harpocrates, together the three gods formed the Triad of Medamud. The location of the ancient city of Medamud (from the Ancient Egyptian Madu) was in Upper Egypt about 8 km east-north from Thebes (Luxor). The consort of Menthu was Raet, or Rattawy, the 'Sun of the Two Lands' was a sun goddess and the female counterpart of Ra. The Greek name of Raet was Ratus who became identified with the ancient Greek goddess Leto. Raet was occasionally depicted wearing a vultures crest the emblem of a protector of Upper Egypt (south). More often Raet was depicted in a similar fashion to the cow goddess Hathor, the Egyptian sky goddess of love, joy and fertility, wearing a head dress of cows horns and a sun disk which, like Menthu, occasionally had two plumes on top. The association of Raet with Hathor, the cow goddess, links her with Menthu who was the personification of the Buchis bull god. 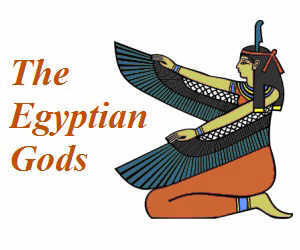 The Triad of Medamud consisted of Menthu the god of warfare, the cow goddess Raet and Harpocrates (as Horus the child). When the Greeks conquered Egypt under Alexander the Great, they transformed the Egyptian Horus into their Hellenistic god known as Harpocrates meaning "Horus the Child"). The location of the ancient city of Medamud (from the Ancient Egyptian Madu) was in Upper Egypt about 8 km east-north from Thebes (Luxor). 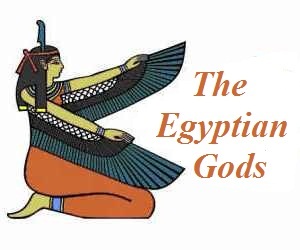 The names of the religious cults cults in ancient Egypt indicated the number of the gods worshipped in the cult and the location of the cult center. 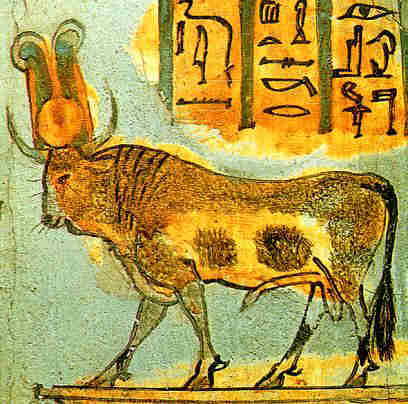 The Buchis bull was the Egyptian holy bull of Hermonthis, the living image of the god Menthu. The Buchis bull was referred to as the Bakha. Hermonthis, now the modern town of Armant, was an important city during the period of the Middle Kingdom and the cult center of the god Menthu. The ancient god Menthu was associated with raging bulls, strength and war. The Buchis Bull at Hermonthis (the Bakha), was considered to be a living manifestation of Menthu, acting as an intermediary between the god and the ancient Egyptian people. Buchis (the Bakha) was also worshipped as a god in its own right and there was only one Buchis bull at a time. The bull was considered to have prophetic powers and was considered an oracle. Food was offered to the Bakha bull and if it took the offering this was deemed to be a good omen. The Buchis bull (the Bakha) had a white body and a black head and was worshipped in a temple associated with Menthu in the region of Hermonthis. The temple dedicated to the worship of the bull god Buchis consisted of two chambers, one for the bull and the other for his mother and was built near the temple of Menthu. During its lifetime the Buchis bull (the Bakha) was housed in the temple and provided with the best food and the utmost care. When these bulls, or their mothers, died, they were mummified, and placed in a special cemetery known as the Bucheum. The mothers of these bulls were considered aspects of Hathor, the mother of these deities. The Bucheum was the burial place of the sacred Buchis bulls of Hermonthis and located on the desert edge, north of the city. The last burial of a Buchis bull (the Bakha) in the Bucheum at Hermonthis occurred in 340 A.D. Discover interesting information and research facts about Menthu, the Egyptian sun god of warfare and protector of the gods. The facts about Menthu provides a list detailing fascinating additional info to increase your knowledge about Menthu in Egyptian Mythology. Fact 1: Menthu, or Montu, was seen as the counterpart, in Upper Egypt, of Re of Heliopolis. Fact 3: Menthu was important to the pharaohs of the early Middle Kingdom but was eventually replaced by Amun the highly influential god of the sun, air and the sky who emerged as a god of the Ogdoad of Hermopolis and then the Triad of Thebes. Fact 4: Some of the greatest generals and kings of ancient Egypt called themselves Mighty Bulls, the sons of Monthu. Fact 5: In the famous Battle of Kadesh, Pharaoh Ramesses II was said to have seen the enemy and "raged at them like Monthu, Lord of Thebes".